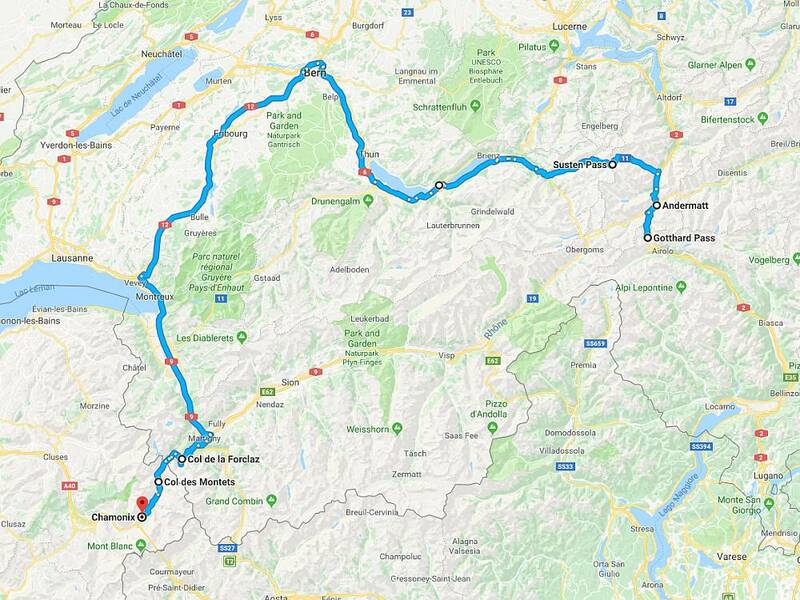 The next couple of days were going to be spent in Switzerland and we’d pre-booked a hotel in Andermatt for tonight. 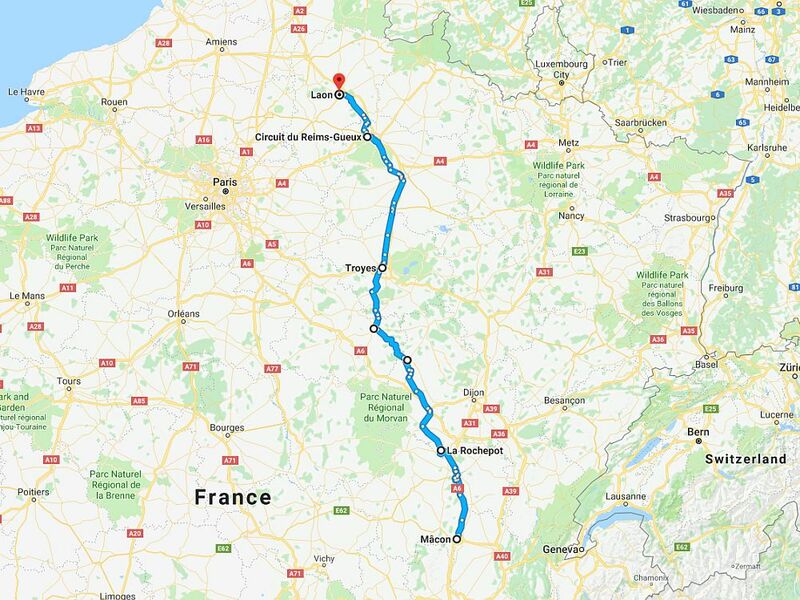 Our ride out there was going to be a fairly straightforward affair. 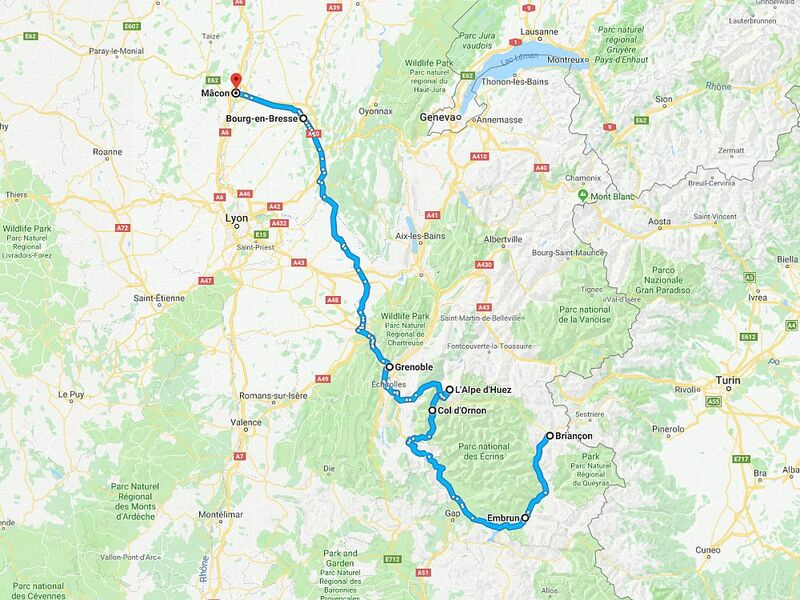 Beginning with our by now usual route out of Chamonix we’d drop over the Forclaz and head north-east towards the Furka and ultimately Andermatt. 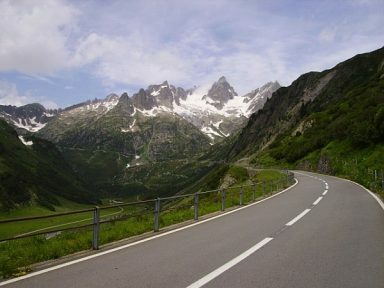 We left Chamonix due east over the Col des Montets and Col de la Forclaz, through Martigny and on to Brig. 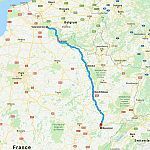 Leaving Brig the road got more interesting and eventually we passed Ulrichen – the start point for the Nufenen Pass. 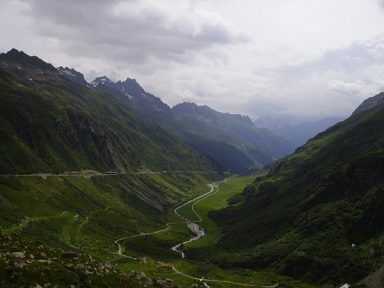 Very soon we reached Oberwald and this is where the Furka Pass starts in earnest. 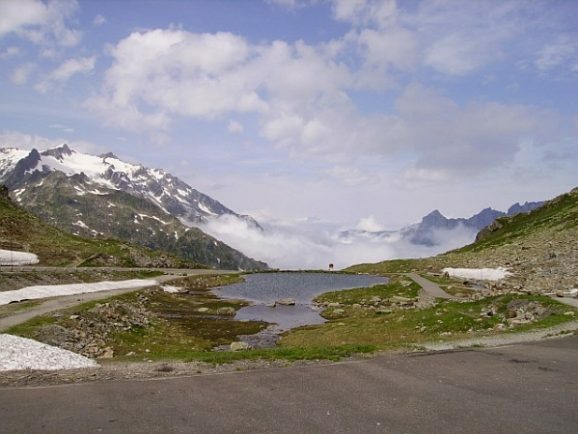 The road up from the western side takes you past Gletsch and at this point if turn left the road will take you up the Grimsel Pass. We weren’t riding it today though so we carried on towards the summit. 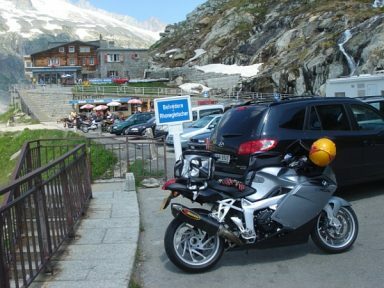 Just before we reached the top we stopped off at the Rhone Glacier viewing point and from here you can just about see where the Grimsel and Furka meet in the valley floor below. 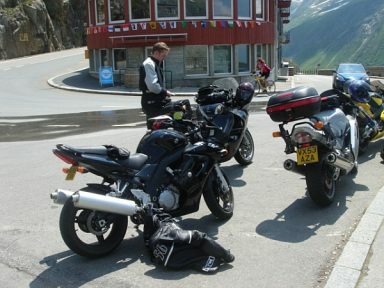 After a quick coffee we got back on the bikes and continued on up to the summit. 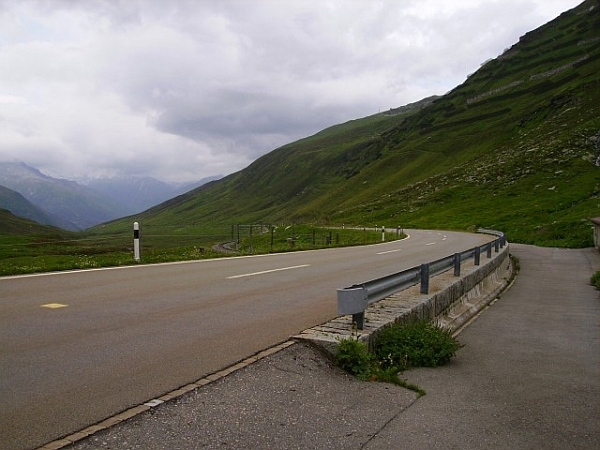 The pass going down into Andermatt on the eastern side is much tighter and without the benefit of any armco or any similar protection on the open side of the pass. A momentary lapse of concentration at this point and you are facing a long drop. 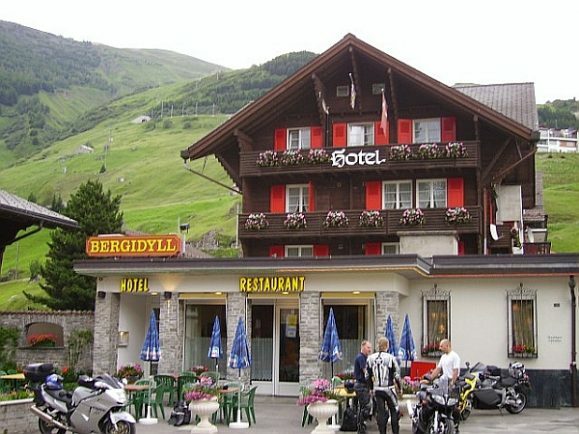 The hotel we chose, Hotel Bergidyll, was very popular with bikers. 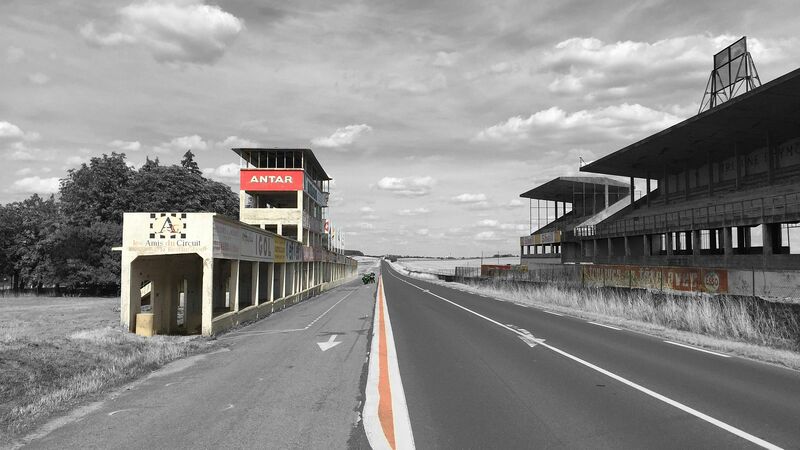 With secure parking, reasonably priced, and with good food it wasn’t difficult to see why. 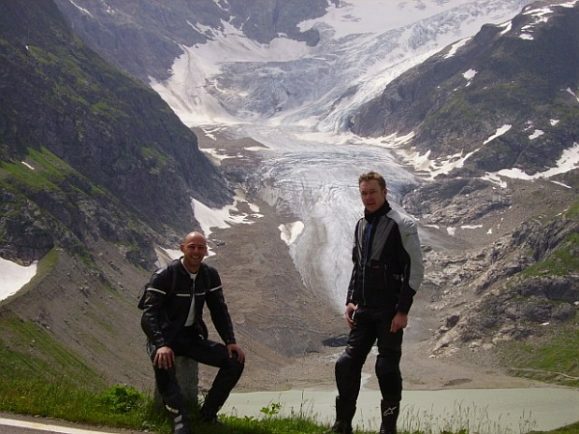 Once we’d checked in most of us were happy to get out of the saddle and relax for the rest of the day – except Phil and Gaz. 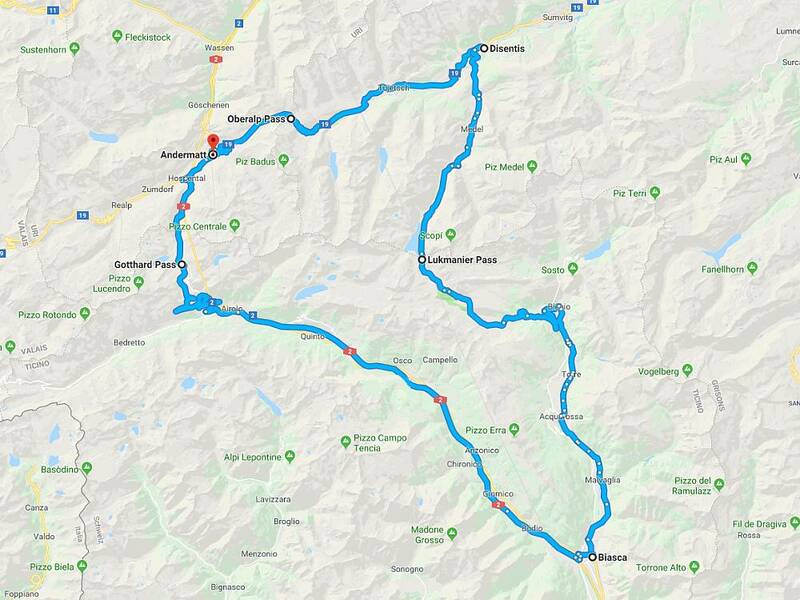 While Chris, Taj and Kyle retired to the bar Phil and Gaz were the only ones with enough energy to get out and ride the Oberalp, Lukmanier and Gotthard pass roads. 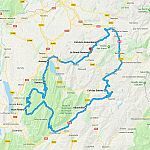 If you’re planning a trip that takes you near Andermatt it’s certainly worth making the effort to ride the 97 mile loop that includes all of these passes. 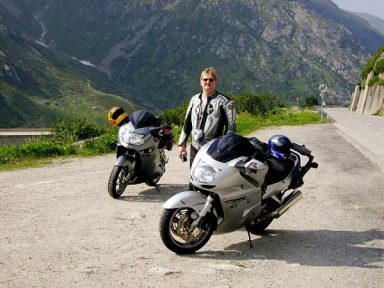 The Oberalp Pass is excellent for bikes with fantastic wide grippy hairpins and great sweepers once you get out on top. 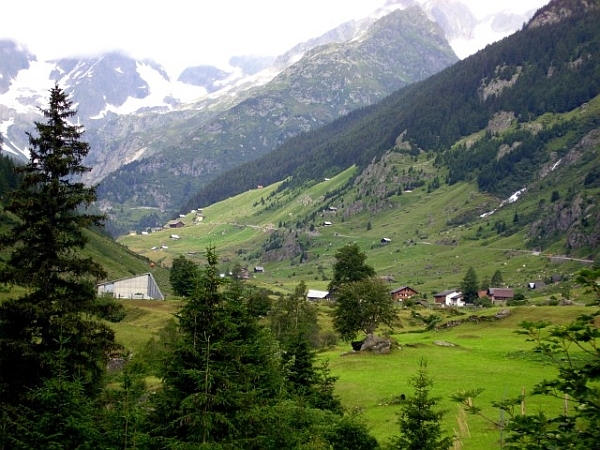 From here you run down to Disentis where the Lukmanier Pass is well signposted. 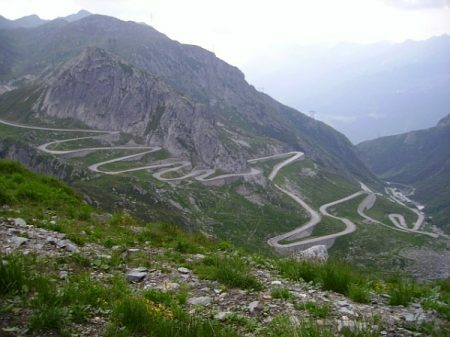 This pass could be one of the best but unfortunately the road surface is terrible. It’s been laid in concrete in what appears to be 25ft long blocks so every second you hit one of the joins between the two. Phil reported that neither him or Gaz could find a comfortable pace. 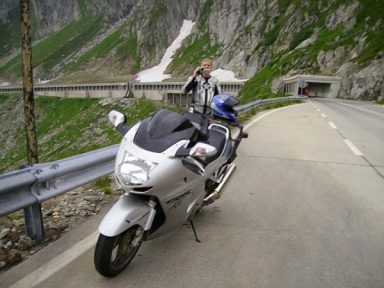 Not even with the K1200’s ESA where ultimately the Sport setting was the best. 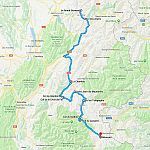 At this point they dropped down into Biasca and then hopped on the A2 to get up to Airolo where the St. Gotthard Pass – or San Gottardo on that side of the pass – starts. 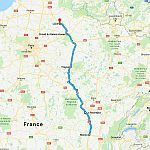 The exit off the autoroute is well signposted but you need to remember that there are two pass roads. 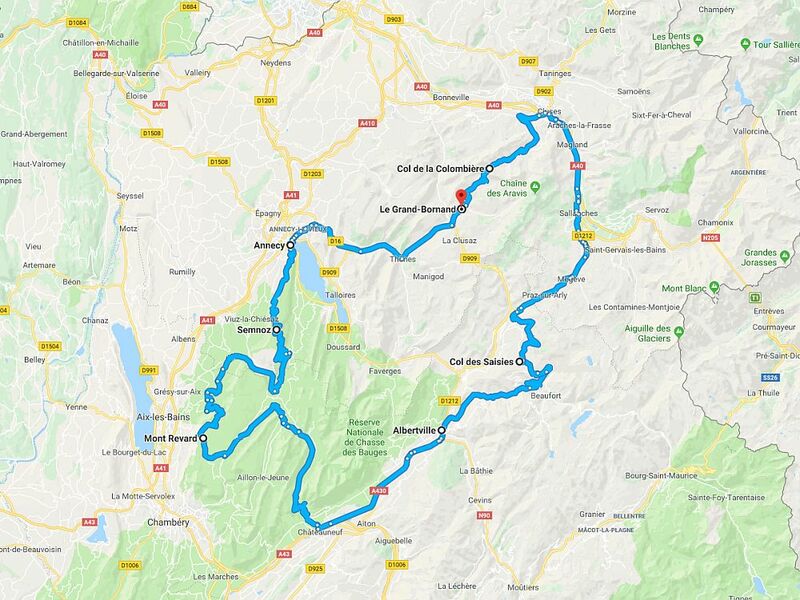 The one signposted is the newer pass – a fantastic bit of road engineering with hairpins built on stilts out from the mountain. 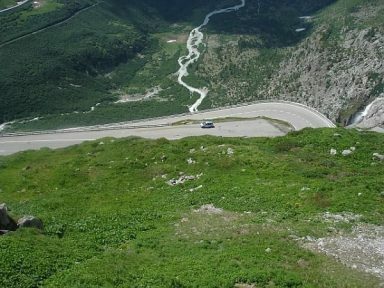 But there is also the old original pass – the Via Tremola – which is still open for those with mountain goat blood in them. 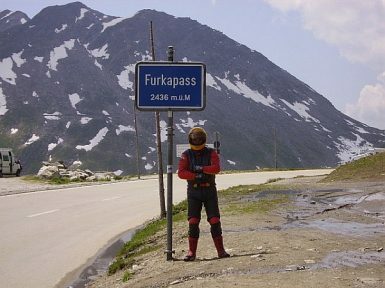 From here it was a straightforward run back into Andermatt. 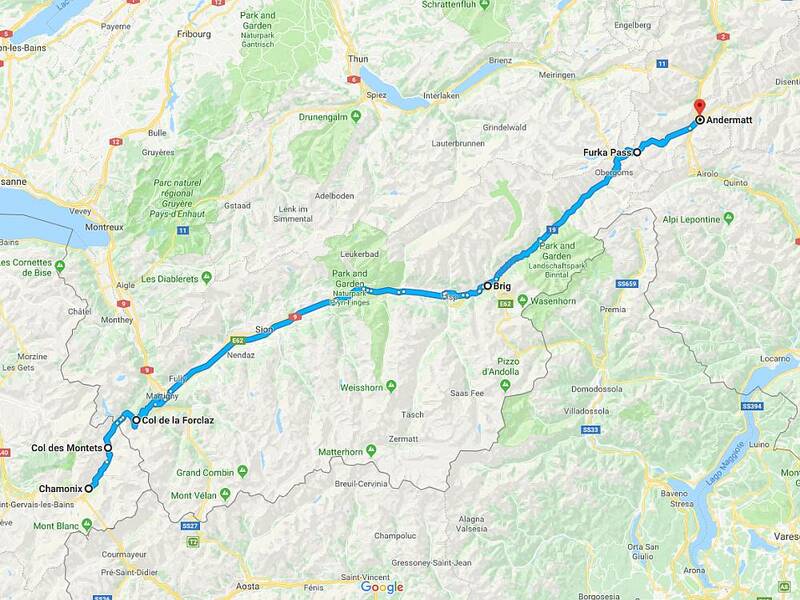 The following day saw us heading back to Chamonix but before we left Andermatt the plan was for Phil and Gaz to introduce Chris, Taj and Kyle to the delights of the Oberalp, Lukmanier and Gotthard pass roads. We were all up and about nice and early, however, from the moment we got up the weather looked decidedly unpredictable. 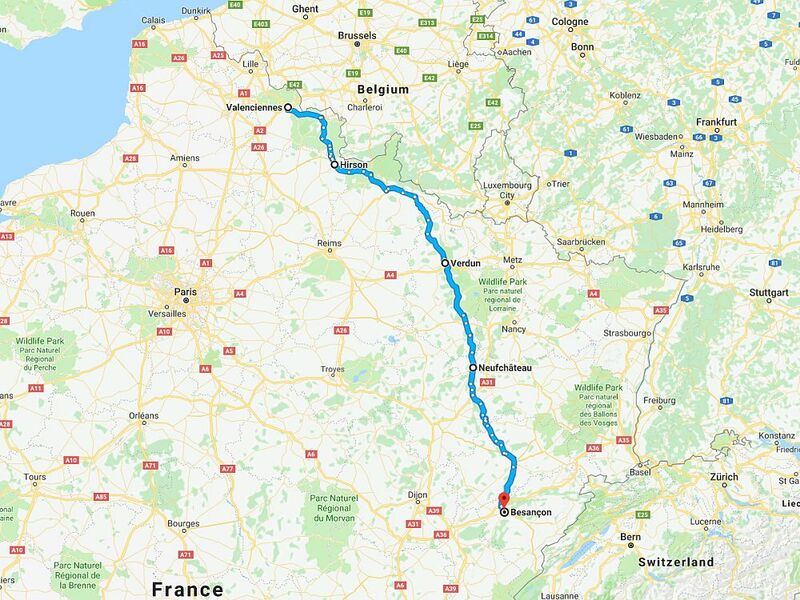 Nevertheless we checked out of the hotel, loaded up the bikes, and headed out. 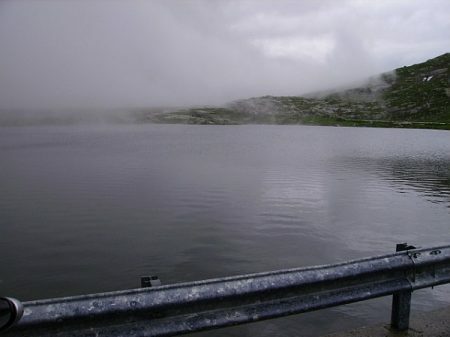 Unfortunately the weather turned very quickly and the top of the St. Gotthard Pass was shrouded in mist. It looked like it was set in for the day too so we had a coffee and revised our plan. 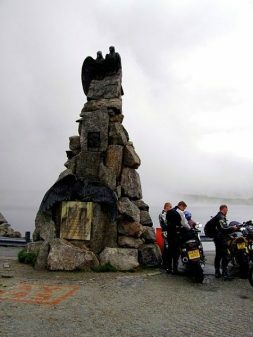 Rather than carrying we decided to turn around and ride back the way we’d come and head for Wassen which lies just north of Andermatt. 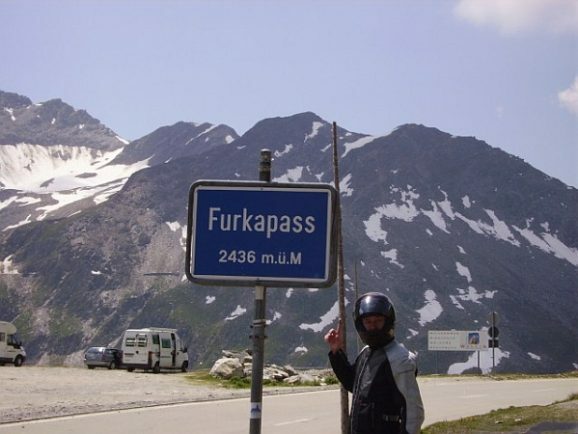 From here we could ride over the Susten Pass to Innertkirchen instead. 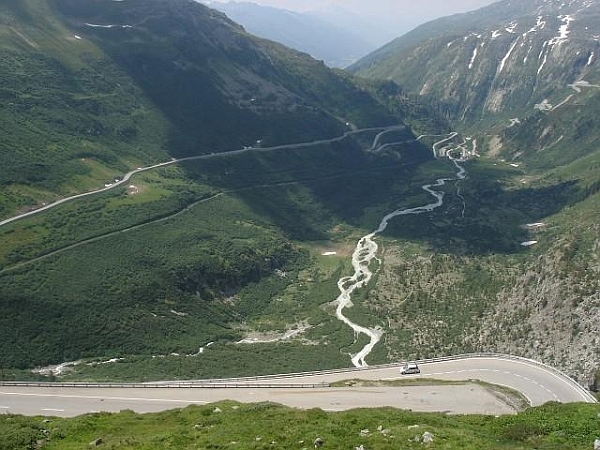 This was a great road, especially going up from Wassen. The pass down was much more difficult and quite technical but still fun and on the way down we stopped by the Steingletscher Glacier for a break. 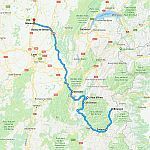 From Innertkirchen we had planned on riding back through Gstaad – playground of the rich and famous – to Bex, but near Interlaken it decided to throw it down with rain so we retreated via the autoroute to the base of the Col de la Forclaz. 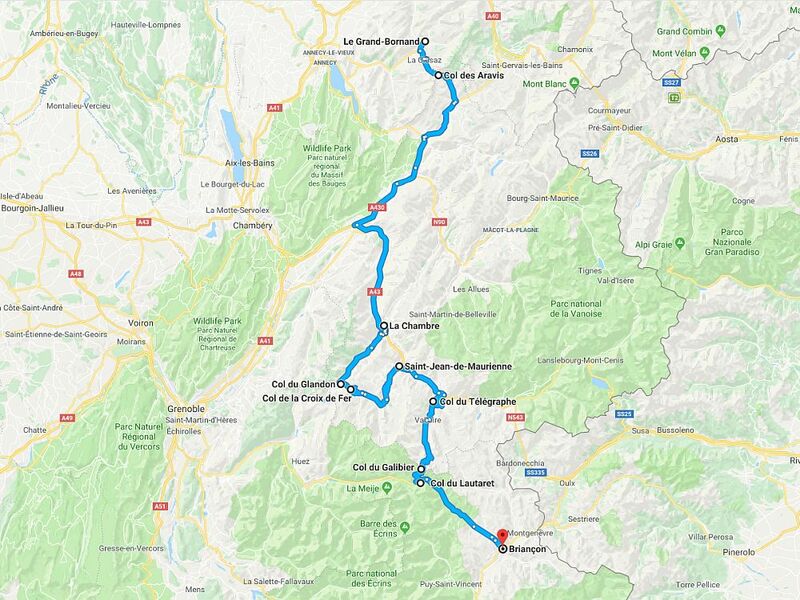 From there we rode up to the bar at the top and made our now regular end of ride stop before heading down the valley over the Col des Montets and back into Chamonix and the chalet.